When Alex and I moved into our first apartment, we were decorating novices. 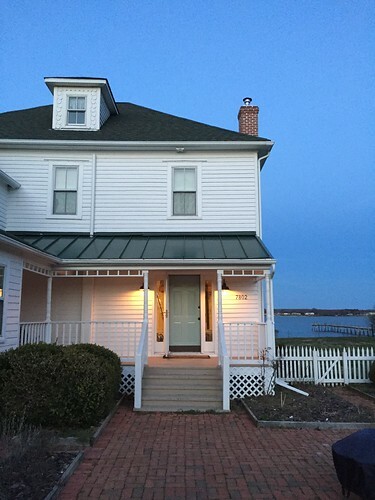 While we tried our best, we came up short in many ways, the most obvious being that we were so anxious to have our new home "finished," that we rushed out and bought what we needed. This resulted in a cookie-cutter straight-out-of-a-catalog look that did little to reflect our personalities, hobbies, or style. As the years have passed, I've learned to better appreciate the approach of curating a carefully selected mix of both new and old. Working in vintage finds, souvenirs and art from our travel adventures, and pieces passed down to us from family and friends along with new pieces creates a more layered, inviting, and less cookie cutter look. It's ultimately a formula that I've found results in the successful completion of a space that is comfortable, interesting to look at, and reflective of our personalities and who we are. 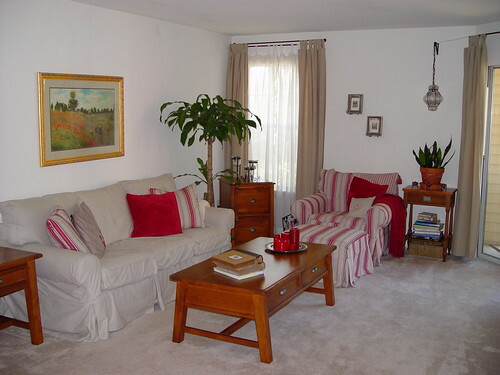 Now that the majority of our focus is on renovating, decorating, and projects in our new home, my approach to its decor is to heavily use these lessons I've learned over the years. 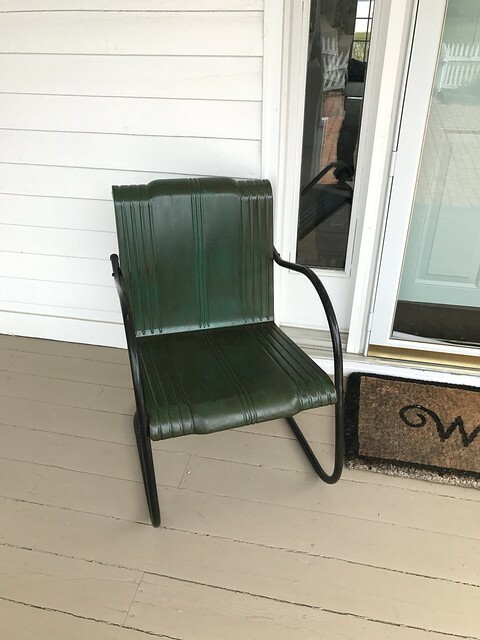 While many people's first reaction in a new space is to run out and buy as many news things to fill it as they can, we're taking a much more measured (and budget friendly) approach to our home's decor. We've been extremely fortunate to have many friends and family members gift furniture and accessories that they could no longer use. So last year when our neighbors offered us a pair of vintage garden chairs that didn't quite work in their home (and couldn't be returned), we jumped at the chance to become their new owners. 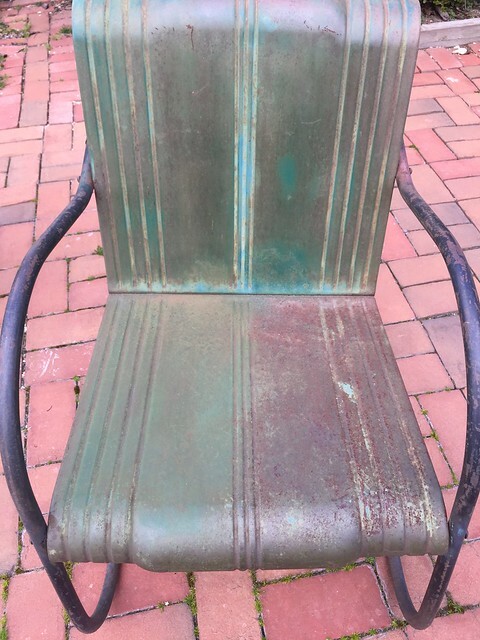 As you can see, this pair of vintage metal arm chairs have a beautiful patina and I loved the blend of several shades of green and turquoise. However, they were pretty rusty, so I knew I wanted to clean them up while still preserving much of the original paint. 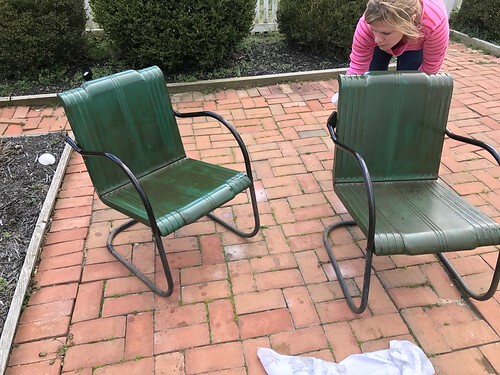 The goal was to both seal them to better protect them from outdoor weather while preserving their patina, and also preserving the pants of anyone that might choose to sit on these beauties. My friend, Sarah, and I tackled this project together, and I have to say not only did it go much faster with a second set of hands, but it was a lot more fun too. We set up the chairs and supplies outside, enjoyed the sunshine and each other's company, and got to work giving each chair a good once over with steel wool. You can see the dramatic difference in the photos above and below after just a good scrubbing with the steel wool pads. We used both "0" and "00" steel wool to knock off any loose rust. The process was a little slow, but the transformation was incredible. I thought that the longer we scrubbed, the more paint we risked removing. But instead, as the top layer of rough rust was removed, much of the original paint became more visible and more vibrant. Instead of mostly brown with a little aqua and turquoise, now we had mostly green and turquoise with a few brown areas. We were thrilled with the result. 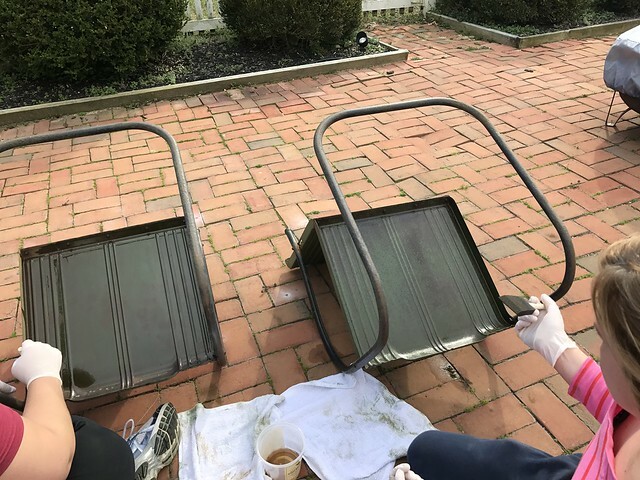 We scrubbed and scrubbed until we were satisfied with the color and our efforts to remove the bulk of the rust. 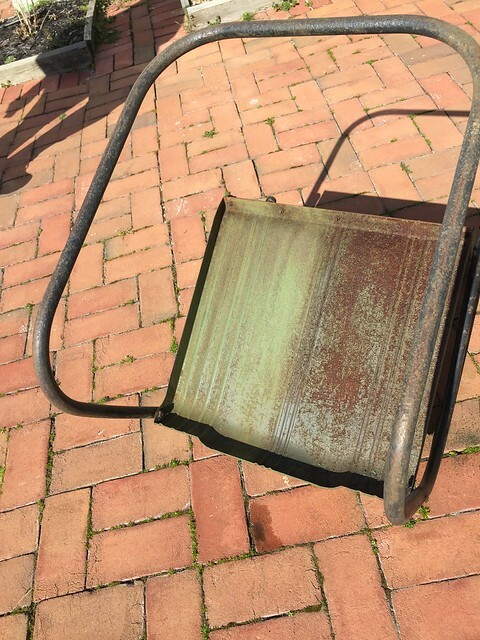 We then wiped each chair thoroughly with a clean rag, and prepared to move onto the next step of the project. 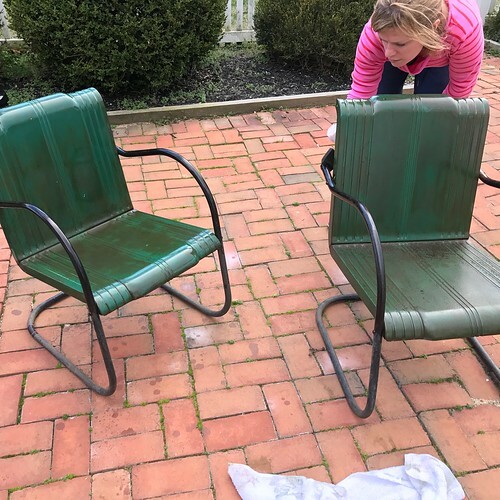 We opted to seal each of the chairs with Penetrol, a paint conditioner for oil based paint. It's a paint additive that allows oil based paint to dry more smoothly and without brush marks, and it's made for exterior oil based and alkyd paints. We had a commenter several years ago suggest using this on the cast iron grate in door of our home in Old Town, as it would seal the patina while still protesting the cast iron. This approach works well for an outdoor application since this product is formulated for outdoor use. 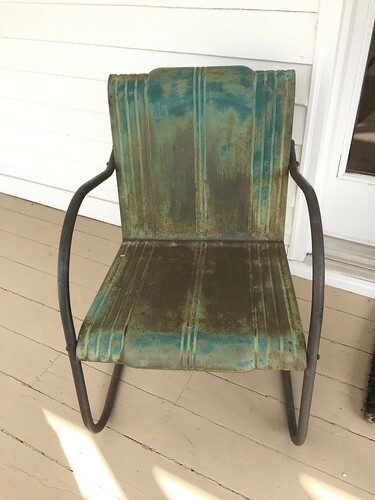 One thing to note, it's really important to use Penetrol and not Flotrol, as Flotrol is water based and would actually rust the chairs (or any bare ferrous metals) when applied. We applied a coat of the Penetrol with foam brushes, and the work was quick and easy. 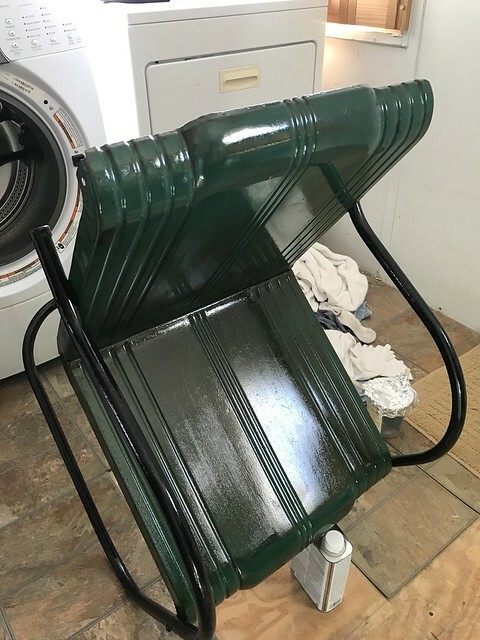 I do have to say, the fumes are really strong so I would recommend working with this product outside or in a well ventilated area. The difference in color after applying the Penetrol was amazing. The color of the original paint was further intensified, and we were now left with a rich, saturated matte to glossy finish. A big storm then started to roll in, so we moved the chairs indoors so they could continue to dry. For good measure, we left them inside for the next couple weeks (since we weren't going to be at the house anyway). I think we could have called them fully dry after about 24-36 hours. Our next trip back we moved them outdoors onto the front porch where they'll now live. 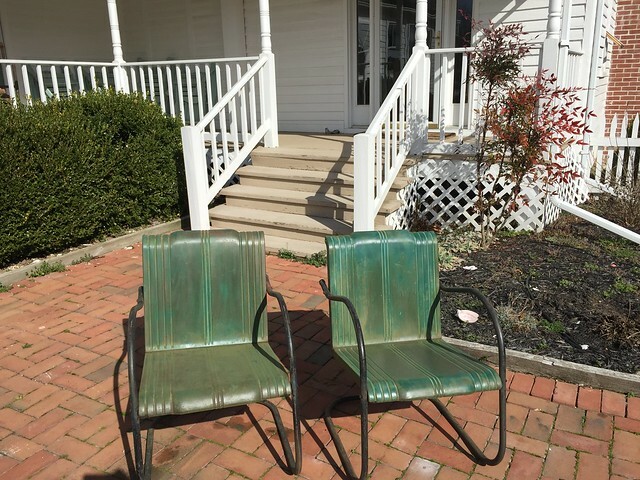 I love how the chairs pick up the light aqua of the front door as well as the darker green hues of our home's roof. Here's a look (at an old photo) for reference. We have plans to spruce up this front porch later this spring, and the addition of the chairs is a solid first step in creating a welcoming entryway on the porch. I'm looking forward to adding a new doormat and a few potted flowers to round out the look. 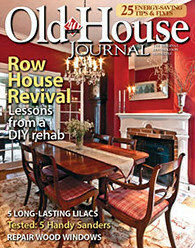 With the arrival of spring, are you doing anything to spruce up your home's curb appeal? 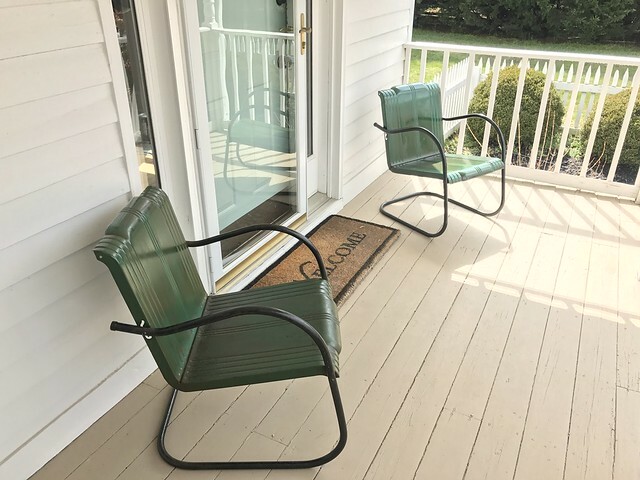 Do you have any ideas for making our porch area more welcoming? If so, I'd love to hear about it the comments. 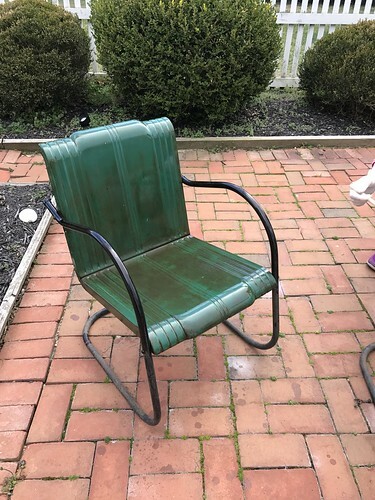 If those chairs have that slight give so you get a rocking motion, they will be the primo spot. Nice refresh on them; I love the colors. For the front porch, maybe a natural/rustic wood element like a small bench, plant stand, sign (nautical theme?) or something more imaginative ;) I also had to scroll thru the LR reveal once again--it is so pretty! This is so great! After being inspired by you , even I have made something ,do check it out! Easily and nicely done. Great job!